I have always been fascinated by apple fritters. They are basically chopped up apples that are barely held together with the least amount of batter possible, fried, and then doused in a silky sugar glaze. They are apple-y fried goodness. More fruit than dough. More breakfast than dessert. More fall than summer. A beautiful, seasonal doughnut. Needless to say, I wanted to make them. And I almost did! But as I pored over recipes trying to find the mix of the perfect one, I realized that apple fritters, with all of its virtues, is not a low maintenance morning treat. There is warming of the milk involved, yeast, kneading, sifting, cooling, waiting…many, many steps. And even though I’m sure they would be worth it, I wanted something immediately. 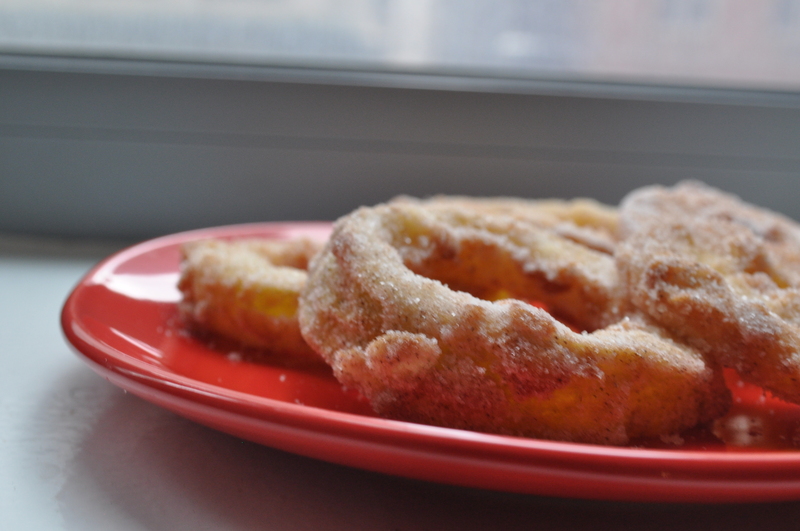 Enter apple fritters’ low maintenance cousin: fried apple rings. These things are deception at their best! They’re shaped like doughnuts! Point for fried apple rings! Plus they have all the properties of apple fritters: crispy fried dough barely surrounding a raw apple that warms and softens, keeping its authentic flavor, with all of the warm flavors of fall. And the best part of the chiller, dare I say, cooler, treat: they’re ready in minutes, and you can eat them immediately thereafter. 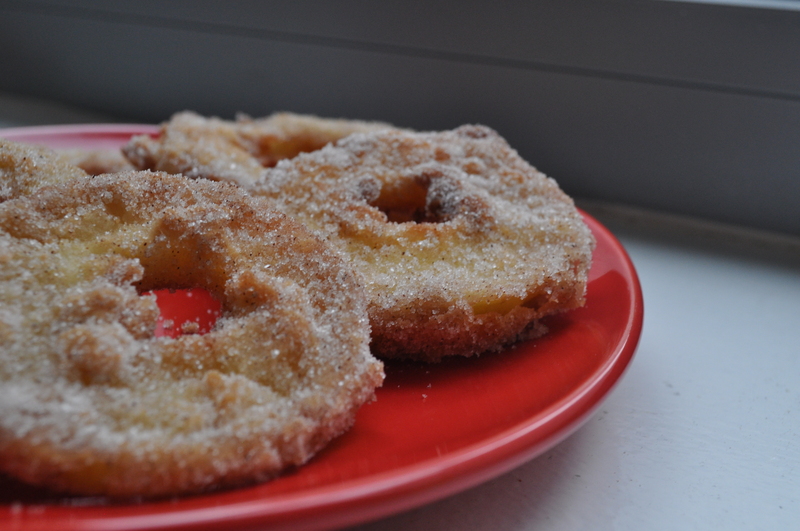 I’m sure I will make authentic apple fritters at some point during the lifetime of this blog. And when I do, I will certainly justify my decision to do so. And hopefully, you will join me! But for now, I ask you: why wait? In a medium, wide-rimmed bowl, whisk together the topping of sugar and cinnamon. Set aside. In an another medium bowl, whisk together flour and cornstarch. In yet another bowl, whisk together milk, egg, spices, baking powder and salt. 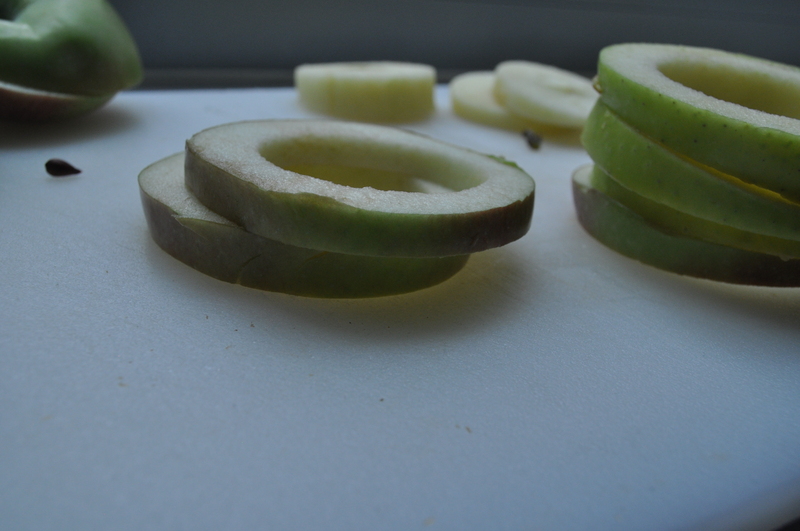 Prepare apples by slicing them into about 1/3-inch thick rings. Use a small biscuit cutter to cut out the core. You can also core the apples with an apple corer first, and then slice them. Soak all of the apple rings in the juice of 1 lemon. 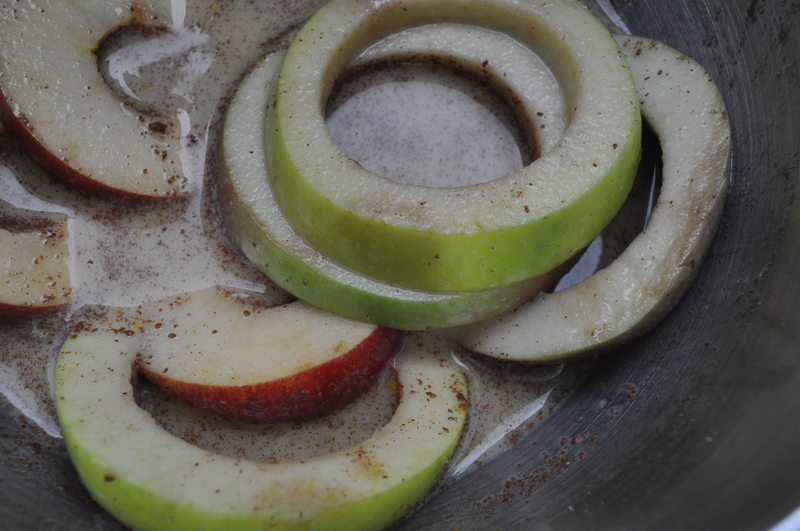 Soak apple slices in milky batter mixture. Set the panko mixture next to the milky batter. Heat a heavy bottom sauce pan with 2-inches of oil to 350 degrees F, measuring heat with a candy/fry thermometer. When oil has reached 350 degrees F, or, when it seems ready when tested with a bit of flour, fry the apples. Using a pair of tongs to remove a few rings from the milky batter, and coat in the flour mixture. Once throughly coated in dry mixture, use tongs to carefully place rings in hot oil. Fry about 4 rings at once. Fry until golden brown, flip over and fry until golden. 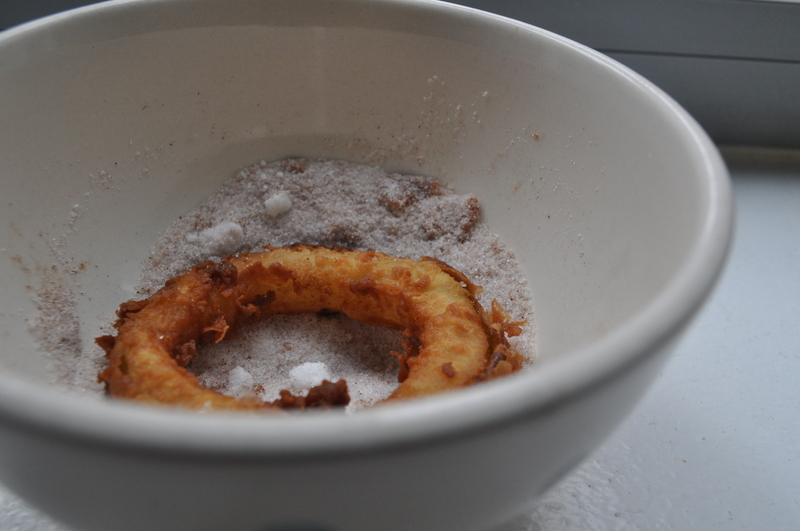 Remove from oil, place on a paper towel and fry the rest of the apple rings. Then immediately coat with cinnamon sugar mixture, and lay onto a wire rack. Bring the oil back up to 350 degrees before adding additional apple slices. Keep the fried apples warm in a 200 degree oven while the others fry. Serve immediately. This entry was posted on	November 3, 2014 at 10:28 am	and is filed under Uncategorized.